There are many reasons dogs can become dangerously overheated. Dogs have sweat glands only on the pads of their feet and cool themselves primarily by panting. 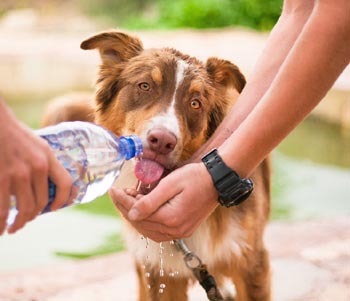 Heat stroke in dogs occurs when the air is hot and humid. In these conditions they cannot rid themselves of excess heat efficiently. Therefore heat exhaustion or heat stroke is more likely to occur during the first hot day of summer when it is 85 degrees than on a 100 degree day in August. Dogs are used to the heat by the end of summer and typically their owners know enough by then to take it easy. Early in the summer dogs are not yet acclimated to the summer heat. Even if it’s only 70 degrees outside, the inside of a car can quickly rise to over 100 degrees! Physical exertion during the heat of the day. This can include going for a walk or run, playing outside, chasing wild animals along the backyard fence, etc. Similarly heat stroke can even occur inside if the house is hot and not well ventilated and a dog becomes overly excited. Being outdoors in hot weather without access to cool water and shade. Dogs that are tied outside can sometimes get trapped out of reach of shade or water. Dogs that are kenneled outside can sometimes get overheated if the kennel is exposed to long periods of direct sunlight. They can overheat even if they have access to a dog house because it may not be well ventilated. Bulldogs, Boxers and Pugs have short noses, small airways and excess tissue in the back of their throat that can make it difficult to get rid of excess heat. Overheating can occur in a poorly ventilated dog house, cage or crate. Several dogs have suffered and even died while under a cage dryer such as when a dog is groomed. Dogs who are overweight can suffer a stroke or heart attack. Medical ailments such as heart or airway disease, or any condition that impairs breathing. Being very old or very young. Bright or brick red mucous membranes and the gums just above the teeth are a good place to check color. The gums may also be dry to the touch. Elevated rectal temperature – seek immediate veterinary care if over 105F. Death can occur within 20 minutes. It can occur in a few days from delayed complications such as kidney failure. Move the dog indoors or to a cool area immediately. If in an enclosed crate, remove the dog immediately. Wet the dog down with cool water but do not use ice water. It will make internal cooling more difficult by constricting blood vessels. Take the dog’s rectal temperature. If it is over 105 F, transport immediately for veterinary care. Know where the nearest emergency clinic is located. Call en route to let them know you are coming. Do not cover your dog during transport. Do not even use a wet towel, This can prevent heat from escaping. Offer water to drink during transport. Small amounts only as large amounts can cause vomiting. Transport dog in an air-conditioned car or lower the windows so circulating air can help with evaporative cooling. If you are monitoring your dog’s rectal temperature during transport, stop cooling measures when it reaches 103 F.
Even if your pet seems to respond to treatment a veterinarian should still be consulted. An evaluation by a veterinarian can be helpful to check for internal problems. Complications from heat stroke can develop several hours later due to organ damage caused by high internal temperatures. Never leave your dog in the car when outdoor temperatures are over 70F. Restrict activity during the heat of the day. Allow dogs to gradually acclimate to warm weather, especially if they are physically active. Provide access to adequate shade and lots of cool water when dogs are outside. Keep breeds at risk, very old or young dogs, or dogs with health conditions indoors during times of hot weather. Ideally, you should always keep all dogs inside when a heat advisory is issued. Use misting equipment, fans or wading pools to provide extra cooling measures for outdoor dogs.